Made in Thailand of the highest quality 100% hand-carved solid granite, this durable mortar and pestle is an important tool for Thai cooking as well as around the world. We source the raw material from the finest granite quarry. Our charcoal-grey granite is not only the most functional tool in your kitchen but also a striking work of art (see testimonials below). Infuse fresh ground flavors of basil, sage, tarragon, garlic, pepper and much more. The highest quality mortar and pestle you will ever find. What sets it apart from others is the generous capacity, the beautiful appearance, and you can whack it as hard as you can without fear of chip or crack. You'll know when you pick it up that it will last a lifetime--they're very heavy and solid (see detailed measurements below). The mortar is carved by hammer & chisel from a single block of grante. Nobody offers the same premium dense (super hard) granite, we are absolutely certain of that. Others sell weaker immitation rock so beware. We no longer sell our product at Amazon.com. Non-ImportFood (including Chinese made) are peddled there as the ImportFood product, but don't be fooled. Order from us here, get the real thing, and support our family-owned small enterprise. Grant Achatz "Chef's Secret Weapon. It's pure manpower"
David Rosengarten says "Please don't live without the ImportFood mortar/pestle"
Mark Bittman (NY Times) "ImportFood.com is a great place to buy a mortar and pestle"
We expect to get more 7", 8" and 9" by May or June. 7" (left), 8" (middle) and 6" (right). Click to enlarge. Note the extremely fine granite used, and the beautiful color. The 6" has been used for a few years, see how it darkens throughout as natural oils give it a fine patina. The others show how they look as new. 7" has 2+ cup capacity, weighs 12 lbs. 5" inner bowl, 4.5" height, 7" pestle. 8" has 3+ cup capacity, weighs 15 lbs. 5.5" inner bowl, 5" height. 7.5" pestle. 9" (not shown) has 5-6 cup capacity, weighs 24 lbs (VERY HEAVY). 6 1/2" inner bowl, 6" height. 8" pestle. The 9" version actually takes one person two days to make, using a hammer and chisel to shape the item then the interior bowl is finished by hand with an electric router. Shown here is a brand new set, next to the 7" version we've used almost daily in our own home for over 12 years (incidentally the one we use was returned to us from a customer who didn't like a small fleck on the exterior, we liked the distinctive mark and kept it for our own). Note how the stone darkens up over time due to oils in your food and on your hand. We love this tool but find the 7" size adequate for home use. The 9" size weighs over 20 lbs and has a 5+ cup capacity. Dimensions vary a bit, some mortars may be slightly less than 9" but not less than 8.75". The pestles range from 8.5" - 9". All units weigh at least 20 lbs and have at least 5 cup capacity. The same super-dense, attractive solid dark granite machined to a precise 6" square block. The mortar is 2.5" tall and has a 1.5 cup capacity, pestle is 6" long with a nice taper, and the top half of the pestle has a granite polish applied to it which gives the look of it having two colors. Complements any countertop, with an elegant style. The bottom, sides and top are all perfectly smooth, and the inner bowl is machined smooth as glass. It works great as a natural grinder for all kinds of herbs & spices, and it would be a very nice gift particularly for someone who has granite countertops. Based on appearance alone, it looks like it's worth far more than $30 or $40. We've seen something similar in an art gallery for $150. Click more views. We select only the very best quality granite, unlike other traders offering softer raw material. You will not find better raw material if you buy from us! To a Thai cook a high quality mortar and pestle is as important as the best quality skillet is to a Western chef. Like iron cookware, the stone mortar and pestle becomes seasoned with age. With experience, the mortar becomes more responsive and you'll learn to blend flavors like never before. Rustic in appearnce, and unchanged for centuries, this device enables the cook to grind, mash and pulverize the melange of spices and other ingredients essential to Thai cooking. The most common type, pictured above, is hacked from a piece of granite particularly suited for this tool, and found only in certain parts of Thailand. Working at this craft for hundreds of years, the villagers who hand carve them have made it a fine art. Basic and primitive, there are no moving parts – nothing to break; once purchased, it will last a lifetime. Those electric wonders designed to make cooking easy – the blender, food mill and food processor – have attacked the mortar and pestle, but it has stubbornly resisted and is still found in most Thai kitchens. The reason is simple. It does a better job than its electrical competitors. They cut, while it bruises and mashes, releasing the oils and flavours necessary for an authentic Thai taste. And then, of course, there is the sound. Awakening to the whirr of an electrical appliance doesn't provide the feeling of cultural strength and solidity, created by the thud of pestle against mortar. A stone mortar and pestle is ideal for pulverizing and grinding spices and herbs into seasoning pastes and spice mixtures. Purists insist that this allows the natural oils to be released and makes for better flavors. 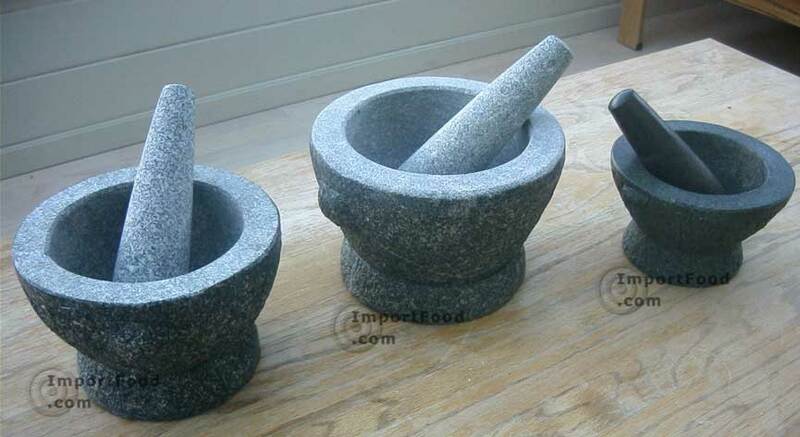 Our granite mortar and pestle will reduce fibrous herbs and hard seeds in no time. The pestle and inside surface of the mortar are polished smooth, so it will not absorb odors from foods. Very dense and heavy, this set does not chip and will last for years, even when subjected to vigorous pounding. The Thai stone mortar and pestle dates back hundreds of years, some say it all started in Sukhothai where the first Thai kingdom was founded in the 13th century AD. The stone mortar & pestle was used to grind food as well as medicine. Considering the key ingredients of Thai cooking--seafood, Thai basil, palm sugar, kaffir lime leaf, garlic, fresh ginger and galanga, tamarind, lemon grass birdseye chilies (and other varieties), you can understand why the mortar and pestle so naturally lends itself to preparation of Thai cuisine. Not all mortars and pestles are fashioned from stone. The ones designed to make som tam – a salad from the Northeast, but now widely popular everywhere – are made from unglazed, fired clay. We have them available also, click here. The pestle is always made of wood, as any other material would break the mortar. The 6" version offers less room to work but the light weight makes it easy to move around the kitchen & sink for wash. The images here on the website makethe 6" look small but in fact it should meet the needs of most home users. The 8" and 9" sizes function well for making curry pastes in larger quantity, as well as sauces, pesto or any fusion of your choise. The 8" version is our most popular size and we believe it's purchased by a more serious chef (rather than a casual home cook). For preparation of larger quantities, and if you really want to get your hands in and work, do choose the 8". If you're a pro or an aspiring pro you may want the 9" heavy-duty version. NOTE: we stand 100% behind the quality of our mortar & pestles because the stone used is absolutely superior, and we know that our prices are the best available for this product. Do compare the weight and capacity of our offering and you'll see that ImportFood.com does have the best value, regardless of the size you order. Thai-style Fried Noodles, "Pad Thai"
Waterfall Beef, "Neua Yang Nam Tok"
Thai Style Spicy Beef Salad, "Yum Nuea"
Salmon in Spiced Tamarind Soup, "Tom Som Pla Salmon"
Thai Spicy Ground Chicken and Toasted Rice, "Larb Gai"
Vegetables with Spicy Yellow Bean Sauce Dip, "Tao Jeeow Lon"
Northern Thai Sausage, "Sai Grok"
These mortars are heavy, well balanced and suitable for rigorous pounding & grinding. If you ever see the way Jamie Oliver uses his, you'll know that this mortar and pestle and take a beating without fear of breakage. The weight of the pestle assists you as well. When using the mortar and pestle, it's a good idea to place a folded dish towel down on the counter first, as the heavy mortar can damage your countertop. When finished, simply place mortar and pestle in the sink and rinse it with soap & warm water. When we met the Prime Minister of Thailand, also a celebrity chef (see story of Thai Prime Minister Samak, and checkout his Tom Kha Salmon recipe) he went right to work in the traditional way--pestle in one hand and a rice ladle in the other to scrape the sides as you pound. We produced this video in Kanchanburi Thailand, where chef Chantana prepares a homemade Thai curry paste using the solid granite 8" mortar & pestle. As you can see, this beautiful rustic tool does the work like no other can. See the Thai granite mortar and pestle video. 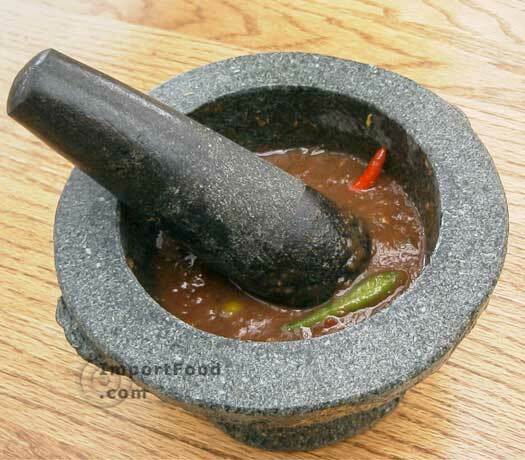 Grandma makes Thai chilli jam "Prik Pao" by hand using the old method, with a granite mortar & pestle. See the video. Thai Green Curry w/ Fresh Chile, "Gaeng khiao wan gai"
The advantage of this recipe is that you pound fresh chiles into a high quality green curry paste, resulting in a more bold, fragrant and spicy final result. See the recipe. Spicy Thai Chicken w/ resh Thai Basil, "Gai Pad Grapao""
This very simple Thai spicy chicken dish uses just a few ingredients, with fresh Thai chiles and the garlic pounded together in a mortar and pestle, and it's loaded with flavor. See the recipe.